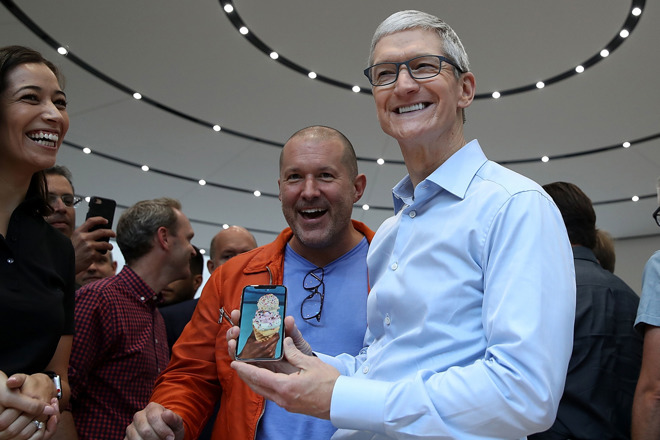 In Apple's quarterly earnings statement, Apple CEO Tim Cook declared that since it shipped to customers, the iPhone X was the biggest seller every week, outpacing the iPhone 8 and iPhone 8 Plus through November and December. Cook's remarks neatly kill the rumors of a poorly-selling iPhone X, and concerns that a premium-priced iPhone would impact Apple's earnings dramatically. An expected "super cycle" has yet to materialize, however. "We're thrilled to report the biggest quarter in Apple's history, with broad-based growth that included the highest revenue ever from a new iPhone lineup. iPhone X surpassed our expectations and has been our top-selling iPhone every week since it shipped in November," Cook said. "We've also achieved a significant milestone with our active installed base of devices reaching 1.3 billion in January. That's an increase of 30 percent in just two years, which is a testament to the popularity of our products and the loyalty and satisfaction of our customers." Cook also noted that the fiscal year 2016 holiday quarter had an additional selling week in the quarter. The top-three selling phones worldwide were the iPhone X, the iPhone 8 Plus, and the iPhone 8. Clarifying his statement, Cook added during the question and answers session that the iPhone X popularity has continued to the present, and is not just limited to the holiday quarter. The iPhone 8 and iPhone 8 Plus shipped to customers starting on Sept. 22. Rumors quickly started after the iPhone X commencement of sales on Nov. 2 that the iPhone 8 Plus was more popular than the iPhone 8 was, and manufacturing orders were being shifted to accommodate the balance, and the then stock-limited iPhone X. The iPhone X pre-order process rapidly progressed to six-week back-orders. However, most if not all of the supply issues were resolved by mid-December, with the device readily found on store shelves the week before Christmas. Apple doesn't provide breakdowns of sales of each model in its financial reports. Overall iPhone sales for the holiday quarter, were down 1.2 percent year over year, reaching 77.3 million units, coming short of investor expectations. However, revenue from the iPhone came in higher than Wall Street anticipated, due to the average selling price reaching $796.42 —a new record.